I know there are a ton of posts on climate control but I haven't yet found one that exactly matches my symptoms. The panel is backlit but doesn't display anything. I installed a new (rebuilt) panel from Eckler's today (yes I know I am 'throwing parts' at it but it seemed logical). The new panel does exactly the same thing. I noticed there is a disconnected plug near the blower fan motor (yellow and grey wire), I found that on the wiring diagram, it looks like it goes between the "ACC Selector Switch" and the "Outside Air/Re-circulation Door Actuator". But I cannot for the life of me find the plug to connect it to. Not sure if that would fix the problem but probably something that needs to be addressed. So Plan A is to actually fix this...Plan B is to turn the heat on so that at least I can drive it without freezing to death. It's current status is it flows cold air with AC on through the defrost vents. My thought was if I could manually set the temperature control to warm it would last me me until it can be fixed. From other posts i thought I could access the temperature control door behind the blower fan, I have the blower fan off but the door is not obvious (at least not to me). Attached is a pic if the orphan plug, can anyone point me in the right direction ? What year is the car? That makes a major difference. Do you have the C60 manual HVAC system or the C68 automatic HVAC system? That also makes a major difference. I assume it's the C68 system since you say it doesn't display anything, which implies that it does have a display. It's possible that your car is different (year? ), but on my car the outside air door is vacuum controlled. 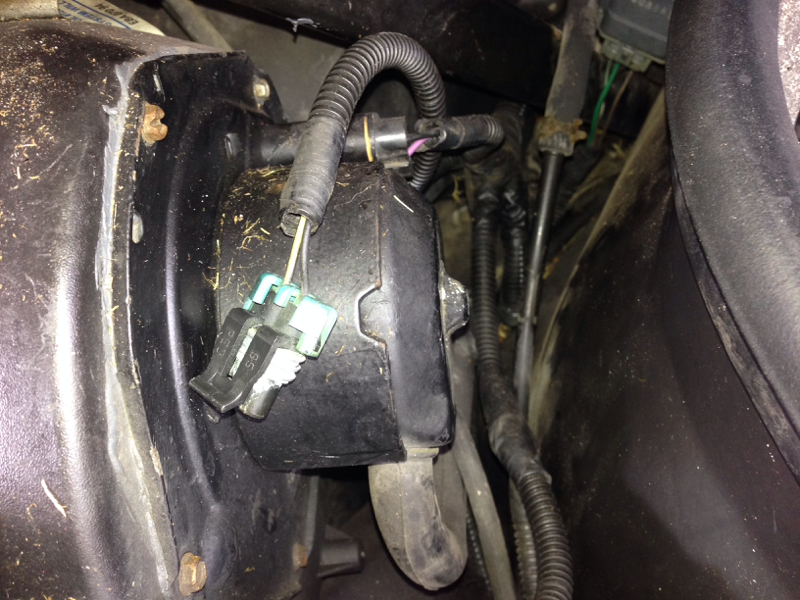 It's inside the car by the passenger's right foot, so that plug is unlikely to go there. You could disable the AC compressor. On earlier years it is controlled by the blower module. Later years have a relay. Unplugging the compressor ought to do it. Last edited by Cliff Harris; 10-13-2013 at 03:53 AM. Any insight on the orphan plug? Does anyone have a pic of where the Yellow/Grey plug connects on a '94? Ok so I went through entire fuse box and tested every fuse, my interior lights work now (woohoo) but it didn't help the climate control. If I'm missing the 'nothing works at all section' please point me in the right direction. If I pull the big fuse marked AC my display goes blank but still lights up. That's why I mentioned fuses. I also got a SYS code on the speedo when I pulled the fuse. If I pull the big fuse marked AC my display goes blank but still lights up. That's why I mentioned fuses. I also got a SYS code on the speedo when I pulled the fuse. Mine is a 92 and I meant the largest amp fuse in the panel on the rt side of the dash. You still need to pull out the blower control module and look at the blend door. When the ignition is first turned on the HVAC control head moves the blend door fully cold and fully hot to calibrate the extremes. Then it sets the blend door to the position indicated by the temperature setting on the control head. It takes about 15 seconds to do the calibration. You can watch it happen through the blower control module opening. If I have the radio turned off and the blower control module disconnected I can hear the blend door motor doing the calibration. If you scroll down a bit in that thread there is a picture of the HVAC programmer PC board that shows the resistors that get hot. The only thing I can think of that is in that area is the feedback fuse. It is in the wiring that tells the HVAC control head what speed the blower motor is turning. Coolant overflow tank level? My car doesn't have one, so I can't look into that. What year is yours? I definitely do not have a fuse there, what is the small box to the left of the fuse in the pic? Mine is a 1986. The fuse normally fits inside that box. I just took it out for the picture. Is the outside temp sensor hooked up?